To walk in the Gorbals area of Glasgow is to walk through a district of this city immortalised in iconic photographs, a district whose name is known far and wide, for better or for worse, and whose history has been captured in silver by some of the great photojournalists of the British post-War years. I couldn’t help but ruminate on this while there, in the Gorbals (and why is it always the Gorbals, never just Gorbals? ), during a recent photographic assignment. Radical Independence Campaign mass canvassing in support of Scottish independence, in the Gorbals, Glasgow, Scotland, June 2014. ©Jeremy Sutton-Hibbert 2014, all rights reserved. I was there to photograph canvassing and leafleting by supporters of the Radical Independence Campaign during the run-up to the recent referendum on Scottish independence. It was a sunny day, a Sunday, the streets had colour from the flowers people tended in gardens and from the colour of the shutters on a modern-designed apartment block. It was a million miles from some of those iconic images I carried with me in my mind, of Oscar Marzaroli’s fifty-odd Shades of Grey, or Bert Hardy’s two little ragamuffin boys forever linked arm-in-arm heading off on an immortal chore. The Gorbals, © Sarah Amy Fishlock 2014, all rights reserved. The Gorbals, © Chris Leslie 2008, all rights reserved. As I walked the streets it was impossible to recognise any landmarks from those iconic photographs, all had changed, all had gone, buildings torn down and their inhabitant’s memories moved on. All that was left to remember of those earlier times were the black and white images and the infamous tales they tell of poverty and deprivation, of children finding hope and entertainment on heaps of rubble and within chalked games on walls. No one perhaps knows these Gorbals images better that Neil Carragher, a native of Hamilton, Scotland, but now retired and living in Canada. For the past decade or so Neil and his wife Blanche have worked hard amassing a collection of vintage photographs of the Gorbals and know the streets well. After my own sojourn around the same-but-different streets, photographing in digital colour, I spoke with Neil about their print collection. Neil’s interest in these photographs stemmed, perhaps not so unsurprisingly, from originally collecting over a 30-year period art work by the Scottish colourists, and from owning “six or seven Joan Eardley paintings, one of which was a little boy with baggy pants hitched up, an old belt, an orange sweater and a skelly eye. It was so touching. I bought that one just when my mother died which was about 1993 and I still have it here in my collection. I love Joan Eardley’s work. To peruse the images of Neil’s collection is to be reminded of the great power of photojournalism in the post-War years, of the great names of Picture Post, or of pre-eminent photographers Bill Brandt, of John Bulmer, Grace Robertson, Margaret Watkins and many more. Neil reminisced, “As I continued looking for old Glasgow photographs I found that Glasgow wasn’t unique of course, Liverpool was the second port and had just as many problems with immigration and resettling people as Glasgow had. Then I went on to collect photographs of London after the Second World War with children playing in the streets. The fact was I just couldn’t find any more Gorbals photographs but I liked the theme and I thought it was concentrated enough to continue picking up those older photos. But those opportunities he went on to find enabled him to build, in time, his large collection of photographs, “I think it is about 300 prints. I’ve never sat down and counted, but someone told me, I said there must be 200 and they said no there is 300 here. But that is somebody who was going through it with a toothcomb with the objective of taking it and putting it into an archival collection. As a working photographer here in Scotland myself, and as a co-founder and member of Document Scotland – a collective of four working photographers in the documentary field, I was intrigued to ask Neil his view of the industry here. He was happy to share his insight, “I found very few contacts in Scotland that I was able to make that were the least interested in photography. You’re a photographer yourself you correct me if I’m wrong. I contacted half a dozen of the photographic clubs and so on, pah, they wouldn’t give me the time of day. I don’t know why, when, if I do that in North America I usually get some sort of feedback, it’s easier to make contacts. I don’t know. And from these thieves and vagabonds, I wondered does Neil collect any contemporary Scottish photography? Why only stop in the days of Picture Post, even life in the Gorbals now comes in glorious technicolour? “I haven’t tried, nor would I know how to source it. That’s really what I’m saying to you. I did have a contemporary Scottish art collection, young people, contemporary, looking for a sale. What I loved about that was meeting the artist and him explain his work and how he went about it. Now if there was such a medium available in Scotland for contemporary photography I think that would be very encouraging, but I didn’t find it. I assure Neil at this point that there is good contemporary photography being produced here, Document Scotland have been showing work by many photographers at our salons, in our publications and shows. We, as a photography collective, try to enable one viewing platform where collectors like Neil can see work from the young and enthusiastic, as well as old and experienced photographers who are still out there, still walking the streets, carrying colour digital or old school black and white and who are still producing work in Scotland. I mention to Neil that Document Scotland recently had the honour of Glasgow-born photojournalist Harry Benson CBE generously accepting our invitation that he become the collective’s Honorary Patron, and I had noticed that Neil, in his collection, has a few of Harry’s prints. 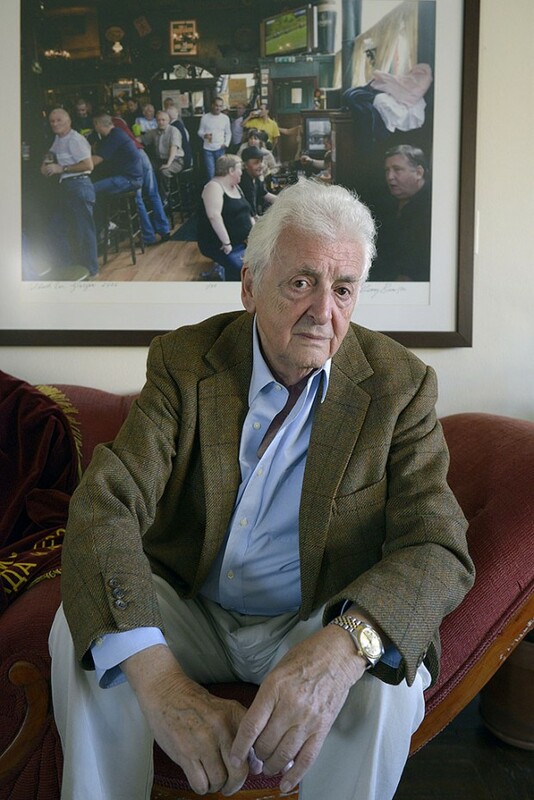 Glasgow-born photographer Harry Benson, at home in New York, © Stephen McLaren/Document Scotland 2014. All rights reserved. And with that Neil accepted my invitation to join Document Scotland for a salon event next time he is home in Scotland, an evening when Scottish contemporary photographers who walk the same streets as Bert Hardy did, entering similar houses as Bill Brandt and Thurston Hopkins, can share work, share thoughts and hopes and raise a glass to those who went before but whose prints still reflect the way ahead. All text © Jeremy Sutton-Hibbert/Document Scotland 2014. All rights reserved. The images reproduced above do not form part of Neil Carragher’s Gorbals collection and are used as examples of contemporary work from the Gorbals area, by contemporary photographers. Chris Leslie has been documenting the changes in the east end of Glasgow in his project Glasgow Rennaissance, and in his new book ‘Nothing is Lost‘. Thanks to Marc Boulay, formerly of the St. Andrews University Special Collections Photography Archive, for the introduction to Neil Carragher and his collection of Gorbals images. And of course thank you to Neil Carragher for sparing time to chat and his kindness in allowing us to write about his collection. Thanks Neil! See also The Gorbals, by photographer John Claridge, from Cafe Royal Books.